I've been reading in a few places that a 3rd party cooler doesn't fit well in this board cause the ram is very close to the CPU. I'm looking for recommendations for very quiet coolers that people have had no issues installing in this board. What cooler are you concerned with, that would help so we could try to find if others are using the same or had issues with it. i don't have any one cooler in particular that I'm interested in, just looking for overall recommendations. The only main thing I'm looking is for it to be a quiet as possible. Which CPU do you have and more important how high you intend to OC if at all. I thought the K CPU come with a better cooler, isn't it so? I think you will find the D14 to be a monster and an overkill for the 1155. I have the NH-U12P SE2 which cools nicely at 4.8 (the wall for my chip). If you are concerned about the RAM seating then you could like at the NH-C12P. I have the Antec 620 H2O cooler. Using IC Diamond 7 paste instead of the stock preapplied paste. Idles at ambient (20-22C) and under Intel Burn Test (stress test) I don't exceed 55 degrees on any core. Using same cooler on my gf's rig and her temps are nearly identical at ambient. Load temps are under mine because its not overclocked and it's using the stock preapplied paste on the pump/waterblock. Antec 920 should be out on the 22nd of this month. The 620 performs on par with the H70 from Corsair so I can only speculate to the performance of Antec's 920. I also have a Xigmatek Dark Knight for my e6300 C2Duo 1.86GHz. That is overclocked to [email protected] 1.34vcore and temps are a few degrees over ambient and load is 58 degrees. The Dark Knight is using MX-2 TIM. 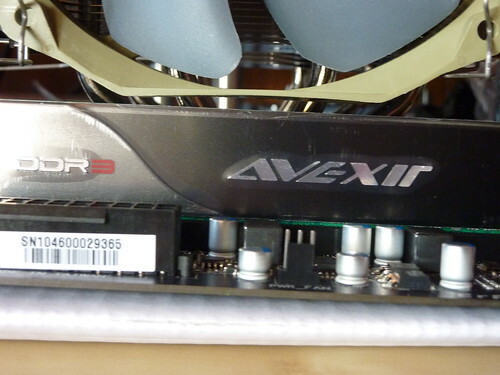 Really tricky to install the paste on a HDT cooler because you have to fill in the gaps. I also heard the Cooler Master 212 is a good cooler except for the fact that it has to be installed upside down; heatsink first and then the back plate. The Cooler Master Hyper N520 uses the same method of applying the heatsink, heatsink first and then the back plate, which made it almost impossible to install correctly and avoiding air pockets. That was the first cooler I used on my gf's rig and I returned it for the Antec 620. Much better performance and easier to install. 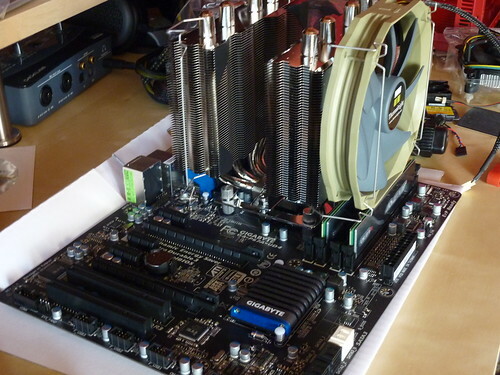 Not to mention less weight hanging off the motherboard and the neatness of it all. The all in one liquid cooling solutions aren't real water cooling as they perform almost as good as a high end air set up. Pros are obviously less weight, aesthetically pleasing, and ease of installation along with near silent operation. Cons are, well, water. The sealed solutions, such as the ones I spoke of, do not tend to leak except for those rare instances where a novice would install and corrupt the tubing to restrict flow and/or nick the tubes to cause a leak. Also a risk with the pump ceasing to function, but the bios has an alarm and so does CoreTemp. I have mine to shut down immediately if temps get over a set limit to save my pc from frying in case the fan stop or the pump stops. Then, with the 3 year warranty, I order another one. A normal air set up would run for decades except for the rare fan failure. Like I said, I prefer the all in one sealed liquid cooling solution because its more appealing to me. You just have to outweight the pros and cons of each one. As for my recommendation, I say use the stock cooler for now and preorder the Antec 920. Bigger radiator with 2 fans for push/pull configuration. The 920 is $120 bucks, but again it's sealed so the leakage is hardly a con compared to the custom set ups that run a little bit more which require maintenance. If 120 is too much then opt for the 620 for 70 bucks. Also, Noctua has a list of ram that fits under their heatsinks/fans on their website. Last edited by manoots; 04-18-2011 at 05:57 AM. They definitely did improve on them. The Corsair tubing is very stiff so it can cause problems. Antec tubing is flexible and very thick so it wont kink. I'm saving enough money to build a custom water set up as I dont want a liquid cooling kit except for the one I'm currently using. The temps are good and the construction is good as well. If i ever do experience a tube problem, which I doubt I will with this Antec device, I'll post up the info and let everyone know. I'm planning a custom liquid build that will cost in excess of 200 dollars, so this all in one solution from Antec will buy me enough time.